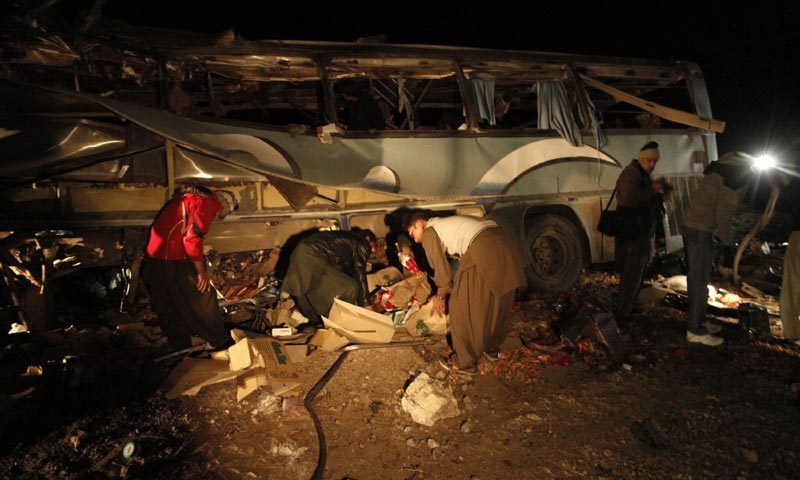 JNN 09 June 2014 QUETTA: At least 30 Shia Pilgrims , including some security Personnel were Martyred and several others injured in two coordinated suicide blasts near the Pak-Iran border, Taftan late on Sunday night an high level official confirmed. Balochistan’s Home Secretary Akbar Hussain Durrani told Jafria News that 10 buses carrying Shia pilgrims had entered Pakistan from Iran. “There were explosions after the buses were parked outside the Hashmi & Murtaza Hotels where the pilgrims were going to stay over night before they commenced their journey back the following day,” Durrani said adding that the blasts were followed by intense firing. He feared the casualties will continue to rise. Four attackers including two gunmen and two suicide bombers attacked the restaurant in Taftan,” he added. Frontier Corps and levies personnel were called in to bring the situation under control. The Bodies of 26 Shia Pilgrims were shifted to Kohat for their funeral , while 3 Bodies were shifted to Quetta for their Funeral . The Funeral Prayer of the 26 Shia Martyr were Performed in Kohat on Tuesday , after which their Burial was also carried out in the local Grave Yard , while the Funeral Prayer of the 3 Shia Martyrs was Performed in Quetta also on Tuesday, and their Burial was also carried out in the Local Grave Yard. Quetta has been an epic center of terrorist attacks against the Shia Community , and especially the Shia Hazara Community , but for a quite some time it has been bit peaceful , but now it looks that the terrorist has again gained some grounds in the area , as even Previously a Number of Shia Pilgrims convoys coming from Iran has been attacked , due to which a Large Number of casualties has been added to already a Huge list of Shia Community Martyrs , across Pakistan. Previously such attacks are always claimed by the Lashkar e Jhangvi Group , which is a Proclaimed Banned Terrorist Organisation , and is the Right arm of Sipah e Sahaba Pakistan , working Under the Umbrella of Tehrik e Taliban Pakistan . Pakistani Shia Community has been demanding a full scale Army Operation across Pakistan against the Mother Terrorist Organisation Tehrik e Taliban Pakistan , and all its associated Groups and Organisations , but the Present PML – N Government is reluctant to give a go ahead to the Operation , while the Armed forces Dissatisfied by the PML – N attitude has themselves started an Contained Operation in the North Waziristan , which is their Primary Hide Out and training Camp of all the Terrorist Organizations , But the Army Chief has said that they will retaliate with double the force , if the terrorist engage them or attack their Men and Installation Only . But the Shia Think Tanks are of the View that if the Pakistan Army feels that they might Need any type of assistance , in the elimination of these terror groups they are ready to follow the , Syria War Example , where the Shia Men fought side by side the Syrian forces and they have even claimed a Huge successes in the elimination of the same Brand of Takfiri Terrorist , which were also sponsored by Saudi And US CIA , to create anarchy and chaos in the Country . Shia Community makes around 25% of the 180Million Population of Pakistan. Which Lives in total Harmony with Sunni Community of the Country , as they have been enjoying good relations and friendships , even Before the Partition of the Sub Continent , the Only trouble Mongers are the Wahabi Ideological touts of the Saudi Government , who are trying to create sectarianism and Dis Integration of Pakistan. This entry was posted in Asia Pacific, Jafria, Pakistan News and tagged Gun Fire, Home Secretary Akbar Hussain Durrani, pakistan, Quetta, shia community, Shia Pilgrims, Suicide attack, Taftan, Tehrik e Taliban Pakistan. Bookmark the permalink.